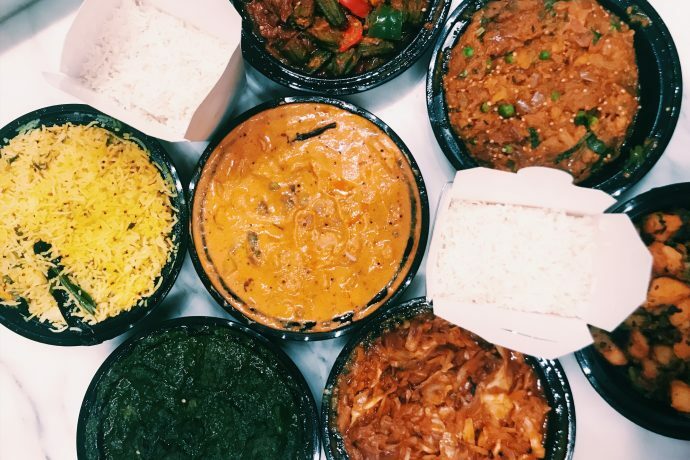 I’VE GOTTEN SO MANY QUESTIONS ABOUT WHERE I ORDER IN, WHAT I ORDER IN AND HOW I ORDER IN, IT’S TIME FOR A FULL POST TO ANSWER ALL THOSE QUESTIONS AND GIVE YOU GUYS A FOOD-COMBINING CHEAT SHEET WHEN IT COMES TO NYC TAKEOUT. During this pregnancy, I’ve ordered takeout much more than I usually do. Blame it on running around after a 2-year-old while pregnant, hormonal exhaustion or just pure laziness, there are certainly a handful of restaurants that I rely on with specific orders so I make sure I still thrive even if I’m not cooking it myself. That said, I always know cooking for myself is best so I save these for those rainy Friday or Sunday nights when the thought of boiling water makes me sleepy. See below! They don’t offer salad so I always get a couple of heads of romaine or red leaf lettuce and use that for wrapping and dipping the various curries and rice. It’s so yummy and fun to eat. Tip: Same goes here, I don’t love their salad here so if you have romaine leaves or big lettuce leaves, I’ll use those to make fried rice lettuce cups. When ordering from Chinese restaurants, always ask for NO MSG. If you’re unsure of what to order at your local Chinese, just go with a double order of steamed broccoli and brown rice. I like to add my own romaine leaves and avocado at home and dress with gluten-free Tamari dressing. Actually one of my favorite dinners. Tip: I like to make a mixed plate of all the salads and dips. I forgo the pita since I find non-fermented wheat bloating. Tip: I actually opt for the non-gluten free crust since it’s so delicious but they do make the best GF crust out there if you’re in the market for one! One fun thing to do with pizza is literally dump your salad on top of pizza and eat your salad as a topping. Don’t knock it til you try it! Tip: Go for a date night, the ambiance is amazing and truly one of my fave restos in NYC. Even a non-vegan will love it! If you order the way I do 😉 They give you plenty of kimchi to go with the meal too but you can always ask for extra 😉 Growing up with a Korean mother, I do crave it often but beware since most Korean restaurants use so much MSG, corn syrup and other additives unfortunately. This is one restaurant that does not. If you are picking another Korean restaurant, always ask if they can do things without MSG. Tip: Their pita here is soo good so it’s hard not to resist, otherwise I just stick with the veggies and mix the spreads into the salad. If you want to do a protein night, keep the feta in the salad and don’t do the potatoes or pita. This is also my go-to order for any Greek restaurant really! All the salads, no cheese, all the non-dairy dips, horta and potatoes. Again with protein, just salads, non-starchy dips and a piece of grilled fish and horta. You can’t go wrong!